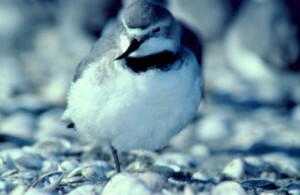 BIRDS: The Miranda Coast is the most important wintering ground for Wrybill. This endemic is unique among birds in having a bill curved to the side. The estimated total species population is only 5300, up to 40% of which flock to Miranda at the end of the breeding season. At least three endemic species breed at Miranda; the New Zealand Dotterel, Variable Oystercatcher and Black -Billed Gull. Other breeding species include Pied Stilt, Spur-winged Plover, White-faced Heron, Banded Rail , Black-backed Gull, White-fronted Tern and Pukeko. Miranda is an important wintering ground for thousands of Arctic nesting shorebirds. 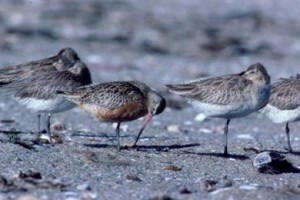 Most common species are Bar-tailed Godwit and Lesser or Red Knot. Other species present in smaller numbers each year include Ruddy Turnstone, Eastern Curlew, Sharp-tailed Sandpiper, Terek Sandpiper, Red necked Stint, and Curlew Sandpiper. In recent years the following species have also been present: Marsh Sandpiper, Pacific Golden Plover, Pectoral Sandpiper, Whimbrel and Large Sand Dotterel. New vagrants are seen on a regular basis, with Semi-palmated Plover added in 2011 and a Shore Plover regular in early 2013. Other species regularly seen include: Grey Teal , New Zealand Shoveler, Sacred Kingfisher , five species of Cormorant, White Heron, Cattle Egret, Royal Spoonbill and occassionally Banded Rail or Australasian Bittern. MIGRATION Thousands of shorebirds can be seen on the shellbanks and tidal flats at Miranda on the Firth of Thames. Many of them breed on the tundra of Eastern Siberia and Alaska. In late September through to early November they arrive exhausted and hungry at the end of the last leg of their epic journey. For some it is two months and over 12,000 km since they left their Arctic breeding grounds.Over the next few months they will remain at Miranda feeding, resting and moulting. Then in late March they will set off once again, flying north to the Arctic. It is a remarkable tale of migration, and it is told at the Miranda Shorebird Centre. Miranda also plays an important role in migration systems within New Zealand. 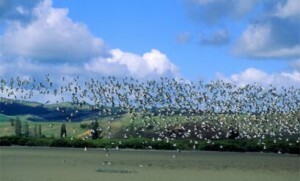 Each year huge flocks of Pied Oystercatchers return after breeding in the South Island. Over 20,000 can be found on the Firth of Thames from late summer. Up to 2500 Wrybill, around 40% of the total number, also flock at Miranda for the non breeding season. At the same time there may also be hundreds of Banded Dotterel. And just in case follow Godwin the Grumpy Godwit on Twitter occasionally he's got something special to say. Shorebirds are here all year round, the highest numbers are present from January to March. The Shorebird Center is open 9-5 but you can go and see the birds whenever the tide is in. The Shorebird Centre has overnight accommodation; self-contained units as well as bunkrooms for hire. Stay with us us while you check out New Zealand's shorebirds. The best time to view the birds is 2 hours either side of high tide. The tide here is similar to the Thames high tide (Metservice). For planning future visits use Linz tide predictions and search for Rocky Point for long range tide times. If you've got a proposed date and aren't sure about the tides call us 09 232 2781 9am-5pm or email us and we'll go through the details with you. Join the trust and support our work while receiving our magazine and other benefits. Make a donation to support the work of the Trust. The trust is a registered charity and donations are tax deductible in NZ. Copyright © 2019 Pūkorokoro Miranda Shorebird Centre. Powered by WordPress. Theme: Spacious by ThemeGrill.